Powder Systems Limited (PSL) hold a wealth of experience engineering containment processes, supplying high-quality customized process equipment to worldwide pharmaceutical, chemical, and laboratory industries. When a leading pharmaceutical producer sought a customized pharmaceutical screener for sieving APIs, PSL combined expertise with Russell Finex to provide a customized solution. A contained screening solution was required, enabling the customer to manufacture potent compounds to CGMP standards. 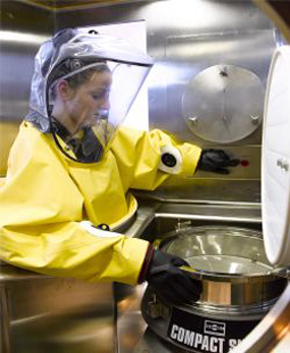 PSL combined its own high containment isolator with the Russell Compact Sieve, providing a unique, safe, usable solution to safely sieve hazardous material, capable of processing compounds with an occupational exposure limit of less than 1.0μg/m3. PSL’s isolator has a half-body suit which allows unrestricted access to the interior of the chamber, whilst ensuring the operator remains safely clear of direct contact with the product. Due to its compact design, the compact sieve was selected for installation inside the isolator. This pharmaceutical screener provides accurate, high capacity screening at less than half the size of traditional industrial sieves, accurately removing all contamination. A customized version was manufactured on this occasion, with the sieve motor needing to be outside of the isolator, for explosion risk purposes. This was therefore placed in a control cabinet with a plate separating the motor from the sieve.